A little while ago, I read a reference to the book Nature and the English Diaspora: Environment and History in the United States, Canada, Australia, and New Zealand, by Thomas R. Dunlap, which was published back in 1999. I don’t have a copy of this book, and not many libraries hold it, so I was keen to find out what the reviews were at the time. However, I was not able to find one single review through my friend, the usually highly reliable Mr Google. Luckily, I was able to ascertain that New Zealand environmental historian Paul Star had done a review of the book for the journal Australian Historical Studies in 2000, and he has kindly given me his permission to reproduce a version of it here. This review is written from the perspective of a New Zealand scholar of environmental history, so is particularly useful for Antipodeans. 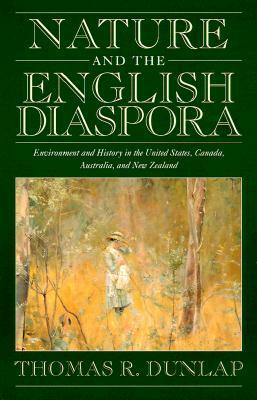 Nature and the English Diaspora: Environment and History in the United States, Canada, Australia, and New Zealand. By Thomas R. Dunlap. Cambridge University Press, Cambridge, 1999. Pp. 350. American environmental historians have tended to look to American examples of the interplay of people, environment and time. Nature and the English Diaspora throws a wider net. There is an Australian precedent for this – J. M. Powell’s Mirrors of the New World (1977) – but Thomas Dunlap has broken new ground, as an American, by comparing developments in the States with those in Australia and (less comprehensively) in Canada and New Zealand. These four lands are Dunlap’s canvas, his subject their settlement over two centuries by westerners and the utilisation of science in their “conquest”. Examples from each country – always interesting, often vivid – illustrate the story. At first settlers ‘made themselves at home on the land by making it like home’ (p. 19), destroying Tasmanian tigers and introducing English skylarks, but in 1850-1900 they confronted limits, expressed through agricultural failure (rabbits keep cropping up) and a declining supply of suitable land. Corporate capitalism and renewed faith in science, coincident with rising nationalism, brought renewed optimism from 1900 -20. In Canada, Vilhjalmur Stefannson persuaded the government to farm reindeer in the Arctic; in Australia, Edwin J Brady attacked the “desert myth” and imagined the country’s arid centre as well-irrigated pasture. Awareness of limits again dominated in 1920-40, as the reindeer starved in Canada and bore holes brought insufficient water to the Australian desert. Dunlap’s American coverage is deliberately selective, to provide greater scope for less familiar material. The Dust Bowl, though a key event both in environmental history and historiography, receives only four pages. The most solidly American section deals with the rise of ecology, which Dunlap describes as a specifically American development. This science unlocked a new door of understanding – one which had remained shut while natural history was the only key and species were only ‘things living on the neutral backdrop of the land’ (p. 55). Awareness grew that ‘living with, rather than just on, the land might be necessary for the settlers’ own survival’ (p 219). By 1948 the central figure in Dunlap’s account, ecologist Aldo Leopold, saw the land as community and humans as its citizens, but there was a time lag before the implications of ecology occurred to a wider public. Rachel Carson’s Silent Spring (1962) was ‘the trigger for the popular environmental movement’ (p. 265). As Dunlap remarks, ‘seeing how the same idea met different fates in different lands can help us separate the influences of land and society’ (p. 14). Nature and the English Diaspora also shows up the limitations of single-country analyses when environmentalism so clearly had an international aspect. But, in seeking to describe the movement in four countries, Dunlap takes greater risks than most of us, travelling where he is not acquainted with all the available material. For instance, he knows of the Save Manapouri Campaign in New Zealand, but not of Neville Peat’s book, Manapouri Saved! (1994), which draws parallels with his prime example, Tasmania’s Lake Pedder. Too many of his New Zealand references are culled from Ross Galbreath, a lone researcher in 1989 but not in 1999. He makes good use of earlier work by Libby Robin, but not of Defending the Little Desert (1998), with its fuller analysis of Australia’s ecological consciousness. And there is the occasional gaffe, such as three references to Governor George Grey as ‘Gray’, and one to Ernest Rutherford as ‘Thomson’ (p. 156). My own research suggests some difficulties in applying Dunlap’s time frame to New Zealand. I would place more emphasis on the continuities of thought and experience before and after an awareness of ecology. And what of gender? There are almost no women settlers in Dunlap’s book – and no girl guides, though we learn that the boy scout movement encouraged nature appreciation and nationalism. I am also uneasy with Dunlap’s conclusion that North American settlers came to see nature and society as two different worlds, yearning for the “other” which was wilderness, while Australians and New Zealanders (he seems to think) just went into the bush and had a good time. There was, everywhere, both a spiritual and a matter-of-fact appreciation of wilder places. Finally, it is a pity Dunlap refers to the ‘English diaspora’ when it was at least British, and that he writes of ‘Anglo’ settlers – a kick in the teeth for Celts and others. This overview of ‘the settlers’ continuing journey from knowledge of nature to an understanding of their place in the land’ (p. 6) is readable and useful, while open to criticism from any specialist into whose paddock Dunlap strays. He has identified some good tracks, which we may now follow, in what was bound to be a chancy venture into comparative environmental history. Next Article Biophilia as an “environment-sustaining instinct”? Very interesting comment on the dangers of thinking you know all when commenting from a distance. Very interesting comment on the dangers of thinking you know all from a great distance.